Our vacation cabin is Paradise for fly fishermen, hikers, skiers, rock climbers, mountain bikers, rafters, kayakers, antique seekers, sportsmen and non-sportsmen as well. 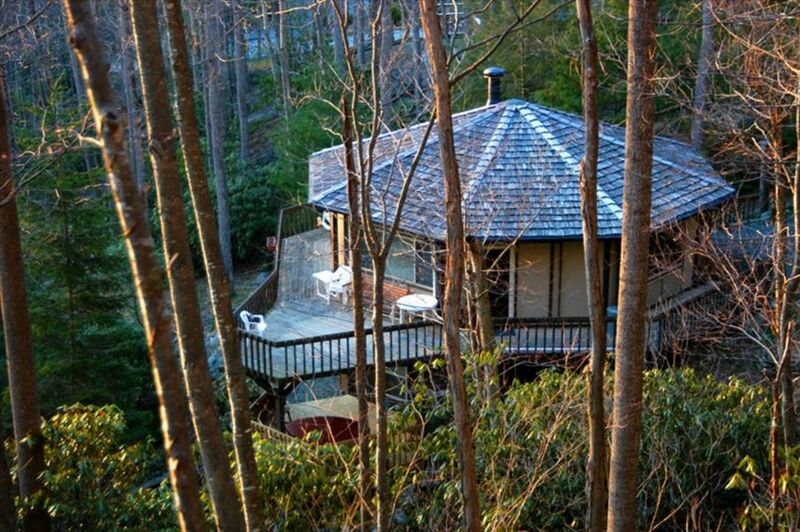 Visit our lovely, cozy 2 story 2 bedroom 3 bath cottage nestled in the woods, surrounded by rhododendron and mountain laurel in a lush setting, but in a secure mountain community known as Hound Ears. You are high and dry in this well stocked and comfortable paradise. We have high speed cable modem access and Wi-Fi for your laptop and all your wireless devices should you need to check in with the office, check email or visit websites. A short distance from your vacation home is the world famous Watauga River where you can fish for Brown, Brook or Rainbow Trout. The area is filled with other rivers and streams to fish from or hike along. There are outfitters available for fishing, rafting, kayaking, canoeing, caving, hiking, and just about every other interesting sporting pursuit. The cabin, with a wraparound deck, provides a wonderful wooded view and is within 15 minutes of Blowing Rock, a small “artsy” town filled with great restaurants and shopping. The city of Boone is also about a 15 minute drive, and will allow you to fill your grocery cart with fine foods and fill your cultural heart with good music and plays. For the family or people of other interests, there is hiking galore, skiing and snow-boarding in winter, golf, Family Billiards, Grandfather Mountain, historic general stores, antiquing, kayaking, horse back riding, gem mining for the kids, rock climbing, and world class spas. After a day out, spend the evening soaking in the hot tub, listen to the sounds of nature on our deck, choose a book from our reading library, watch a movie from our DVD selection on the new flat screen TV... or just CHILL OUT. The community has recently created 1) a dog park, 2) a site to park your car close by for trout fishing in the local river, and 3) lovely hiking trails on top of the mountain in the community. Come visit us. You will be glad you did. PLEASE NOTE THAT THE COMMUNITY, NOT US, NOW REQUIRES A10 year CRIMINAL BACKGROUND CHECK FOR THE MAIN RENTER OF THE CABIN AT NO COST TO THE RENTER. (This is a vacation home/short term rental ONLY. Please- no long term rental inquiries, however, weekly or monthly stays will be considered. 2 couples are the most comfortable in this cabin. We envision 6 people to be 2 couples and 2 younger children as there are two bedrooms and an extra sofa bed for sleeping). A small well behaved/vaccinated dog is welcome (and maybe 2), and there is a non-refundable deposit required for this. Please discuss this when booking. IMPORTANT: No unattended small children should be left outside due to the small pond and potential dangers inherent therein. The cabin is tucked into the forest with beautiful view of hundreds of trees on adjacent hillside. Mountain view only when leaves off trees in late Fall, Winter. Both decks (1st and 2nd floor) overlook a beautiful private pond. A small friendly dog(2 at most) will be allowed. The upstairs deck is gated at both ends and fenced on railings. Caution should be used if you arrive with small children due to the small pond that is adjacent to the cabin. This well stocked house was perfect for our family ski trip. The separate levels were also nice for those who want to rest. Per my kids, the pull out couch on the main level was very comfy for the three of them to snuggle up and watch Netflix on the large TV. My daughter really liked the spiral staircase as it is a very unique feature separating the levels of the house. The outdoor view was amazing. My only tip, is to bring flip flops to get to the hot tub...especially in the winter. Hope to come back soon! Thank you, and we are so glad you had a great experience. Come back and see us again... and bring flip flops!!! Great Location... Very Nice Stay!!! We are a family of 3 plus a medium sized dog that stayed for 8 nights. Over all the cabin was a good value for the money. Not super modern or fancy but definitely cozy. The Cabin is situated up in the mountains in Hounds Ears Club and everyone we met in the neighborhood, guard shack and the dog park were super friendly. The Hounds Ear community is a gem!! You can see houses around you, but they were not too close. Beware that in the snow/icy weather may be a challenge getting to the house even with a 4WD car as the road is steep. The wooded property around the cabin was nice to walk with the dog and the gated deck was perfect to let the dog out for some air. The streams that run thru the property are beautiful especially when viewed while sitting in the hot tub!!! The cabin was clean and everything was in working order. The kitchen was well appointed to cook/eat at home and the BBQ worked well. The gas fireplace was nice touch on cold nights! Instructions on the use of everything in the cabin (hot tub, fireplace, etc.) were clear. The location was PERFECT as it was 15-30 minutes away from everything including Boone, Blowing Rock, Banner Elk, Grandfather Mountain and the 3 ski mountains. Communications with the property manager was excellent! Thanks for a great stay and we would definitely stay here again! Thanks for a great stay!!! Although advertised as having a hot tub and priced accordingly, the very low water level, dirty colour thereof, and non-functional heater strongly suggested that it had not been working for some time. This is an ownership issue. We had booked the place because it had the hot tub as one member of our party needed its therapeutic effects for an injury. Only a pittance was offered as a refund and was not yet paid when this review was submitted. In a winter area with ski resorts nearby, the hot tub should have been operating for the season when most needed. We came away very disappointed. This is a response from the owners to the recent review that complained about the hot tub not working over Christmas. We apologize for that but wish to explain that the hot tub has always held its balance and water level extremely well. It is cleaned and checked after each tenant leaves. It was last treated on 12/6. We then had 22 inches of snow on the weekend of 12/8. It was Thursday the 14th before our property manager could even get out of her own house. The property manager went back to check the house 12/20 and noticed the tub issues. She treated it and it was almost back to normal. The property manager called to see if the folks had arrived on Friday the 21st, and also asked about the tub, and it sounded like it still had problems. She returned to try to work on it, but realized it needed professional repair. She called service men, but they were either out of town or didn’t call back until 12/26. The pressure switch had to be replaced as well as some wiring. We believe we were diligent through our property manager, but that trying to contact a repair man in Boone is not like calling one in a larger city. There are very few, and during a major holiday, it is even more difficult. Again, we are sorry for the inconvenience. Although our stated policy indicates we do not give refunds if appliances fail, we did return what we considered to be a good a refund within a reasonable period of time. We enjoyed our stay. The folks at the security gate were very helpful and welcoming on our arrival. The nearby streams sounded very lovely. The upstairs was quite spacious. All of the rooms have lovely views of the mountains. The second bedroom is downstairs and very separate from the rest of the house, making this a nice house for sharing with friends. We did not use the hot tub, but it was right off the downstairs bedroom. The house was stocked with a great variety of DVDs, but we didn't watch any. There was no dishwasher in the kitchen. The upstairs bathrooms seemed like the prototype for bathrooms of the future, circa 1970. We were amused by them. We brought our dog. She loved the wrap around deck. With the gates closed on both ends, she had plenty of freedom to run around off leash. The house is at the end of a long windy road that climbs up a steep hill. I wouldn't want to drive on it in the winter. It was a lovely walk down to the playground. We got a ride back up, though. The private golf course in this gated community is absolutely stunning. If you have the opportunity to play on it, don't turn it down. And, if you have small kids, be sure to keep an eye on them outside. There is a small pond right outside the house that a child could easily fall into. Poor staff communication, strange odor in second bedroom, not as advertised. We note your comments and are sorry if you were inconvenienced during your stay in our cabin. We try hard to keep the cabin clean, comfortable and well maintained, but sometimes things can be missed. That is why our property managers offered to put you in another property, but you turned down that opportunity. The hot tub does use bromine that emits an initial odor upon removing the cover, but it immediately dissipates. The cleaning service apparently overlooked the few coffee grinds in the freezer (not dirt)as well as a hair in the tub after it was cleaned. We apologize for that. The musty odor downstairs is alleviated by keeping the dehumidifier on, but it was in the off position after you left (although the sign on it advises to keep it on). Our property managers forwarded you a check for your inconvenience immediately upon your request, but you had not yet cashed it by the time you sent your comments to VRBO. Again, we are sorry for your experience, but it should also be noted that, when looking at the comments left in our guestbook and speaking with people who have stayed at the cabin, 99.9% of our guests have had a wonderful and enjoyable experience. Again, we are sorry that you were not satisfied. Great private little cabin and very nice neighborhood! Owners were great with communication with booking! Beautiful private little cabin in a nice neighborhood. Rates: Please note that presently there are required taxes in addition to the rental rate of 12.75% that may change by the time the booking is made. Additionally, the is an $80 processing fee as well as a NON-refundable damage deposits of $20 per dog per night, and a refundable security deposit (assuming there is no damage) which is assessed depending on how many nights/weeks the property is rented. These are all extras and not included in the rate listed. For some reason, and we apologize for this, the site configuration somehow disallows us from advising you of this elsewhere. We apologize for any inconvenience. The best thing is to contact us and we will further advise you of the total. RATES ARE SUBJECT TO CHANGE WITHOUT NOTICE UNTIL RESERVATION IS CONFIRMED. PLEASE ALSO NOTE THAT THE COMMUNITY, NOT US, NOW REQUIRES A CRIMINAL BACKGROUND CHECK FOR THE MAIN RENTER OF THE CABIN AT NO COST TO THE RENTER.